Often the very best sermons are not in church on a Sunday! Karina always has my full attention when she posts – and this post from 2013 has my full attention 5 years later. Karina, these words are very encouraging and such an inspiration. Thank you for posting this wonderful reminder. Blessings! Thank you so much, dear. God Bless. Karin what is the real definition of success. Success is fulfilling the complete purpose for which God made us. It has nothing to do with wealth, accomplishments, stature in life, or standard of living. It has to do with living a life of obedience to the Father. And when we live a life of obedience to the Father, we will fulfill the purposes that God had in mind when he made us. Our role on earth while we are there is to destroy the works of the enemy. God want us to know that our name is known in hell. The spirits are afraid of us because we know the power that God has entrusted to us for our purpose. Many people are ignorant of God truth and walk the earth as prisoners of war instead of God front-line soldiers. The enemy abuses them because they do not recognize the power within them. The Lord has a different measuring stick. The Lord is not impressed with our ability or what I can do for Him. Only one thing delights Him people who fear Him and put their hope in His unfailing love. What does it mean to fear God and place my hope in His love? It means I acknowledge that God is the source of all that I’m. He is the one who gives me the ability to work, plan, and execute. He does not want us to look to our abilities, but to His abilities. Sometimes it is difficult to balance these two perspectives. However, I bet if we ask God to show us how to maintain this balance, He will do it. Then we will know that our heavenly Father is looking on us as a proud Father. Lord, may we fulfill every purpose for which you made us for. May there be no inheritance left on the table that we are entitled to. Thank you very much for your further explanation on my post. I really appreciate it and will become my personal reflection. Thank you and God Bless. Thank you for these words, Karina. My son just turned 50 and has been with the same company for 20 years. His company is closing its doors in a couple months, which means my son will be out of a job. His first thought was that he was a failure at 50. Your words will be great encouragement to him. Thank you. You are welcome, sister. I’m sorry heard about your son and I personally pray he will get a new better job. Thank you and God Bless. Excellent share. It’s good that gave this person a good talk about failure not being the end. Sometimes we all just need a little reminder. Thank you very much for your love comment 🙂 God Bless. 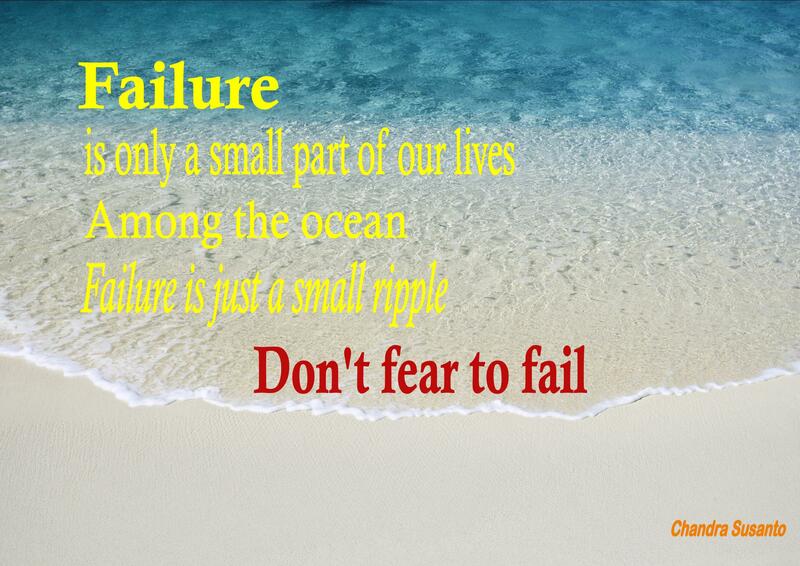 failure is just a small ripple among the ocean. great thought from father Chan.. love it. Thank you very much for sharing this, my gorgeous sister. Then always keep it in you mind, my little sister. Dear Karina, thank you for reposting this. I did not read it the first time. Your director is blessed to work for your company. Blessings to you as you continue to encourage others in the Lord. You are welcome 🙂 Thank you for your lovely response. Blessing to you too. Thank you very much for visiting my blog and reading my post 🙂 I pray for you mission. May God leads you in every of your step in the mission. I’ve been follow your blog. Thank you and God Bless. Amen! Thank you very much, sister June. God Bless. Karina, first I would like to express my humble appreciation to for following my blogs. It is an encouragement every time I notice you’ve “liked” a post. I just wanted to let you know because your opinion is one I respect. So, again, thank you for reading. But the other thing I want to say is that I appreciate this post. I determined last month to return to the business of insurance sales – I am working with Aflac again. Today was one of those discouraging days when seemingly nothing good happened. However, your post pointed out some very important verses to remind me to keep getting back up after a fall. And more importantly, I am reminded by your post that God cares about our work, and we must do all for His glory. Quitting does not bring God glory. Dear brother in Christ, Anthony. Thank you very much for your lovely words. Well, though I’m not read all of your posts but trust me that I love your posts. I can learn many things from your posts. I pray for your work in Aflac. I really know working as marketing insurance has its own challenges but as we know there’s nothing impossible before God and as you said, God cares about our work. Doesn’t mean I’m advising you, just surrender all to God and let God work in our lives. Thank you so much,brother Anthony. Have a blessed day and good luck. Very well written and said. I needed this reminder today. Thank you very much for your lovely comment. God Bless. I just wrote a blog about this for a friend and I also let her read this one. It’s amazing that no matter how you look at the topic it is all the same. Face the failure embrace it and learn from it. Ooh I will love to read your post about failure. Thank you very much for visiting and reading my post. God Bless. Sure thing take a look at it!! I so needed this post Karina! God really does teach us great things from failure. When we know our identity is rooted in Christ, we lose the fear! Thank you very much for your time to read my post also for your lovely comment 🙂 Thank you and have a blessed weekend. I love that! ‘When we are rooted in Christ, we lose our fear!’ Amen! Hi Karina, I like that you included a quote from Thomas Alva Edison, I read his biography once and he basically said ‘without my failures there would be no success’. Like you say we need our failures, their purpose is to improve us, not destroy us. I read a Chinese proverb this week “fall down 7 times, get up 8” not quite as good as Proverbs 24:16 but it is a world wide, cross cultural truth. I struggle with the Western World’s need to label people by their failures or their lack. A person is Autistic or a person is Dyslexic or a person is ADHD. Imagine if Moses had always called himself a ‘murderer’, or David had only been ‘an adulterer’ or ‘the smallest’. What if Abraham had only been ‘unfaithful’ or Joseph had only been ‘a slave’ or ‘a prisoner’. If we only call people by their failures or by the name of their lack we are forgetting God, “The Lord is my Shepherd I Lack Nothing!” We forget his redeeming love and we nullify his transformative power. I love Nick Vujicic, the man born without arms and legs who has been used abundantly as the hands and feet of Christ. We need our weaknesses so that God can show off in us, through us and for us. He is a glorious God who will touch us with his glory when we come to Him in weakness. Thank you for re-posting for those of us who hadn’t read the original! Dear sister in Christ, Lauren. First of all, thank you very much for visiting my blog and read my post. I really appreciate it. Well, there are so many people in this world got success from their weaknesses of failures. Failure is just a small part of our lives and would become a stepping stone to the success. Thank you very much for your great thought on my post. Have a blessed day. I opine, one who fears to fail, just fears to take risk, thus remains cribbing for not being successful in life. I apprise you that I have nominated you for MYSTERY BLOGGERS AWARD. Kindly visit my blog and see for yourself. I nominated your name for the richness of your write-up in spiritualism. Thank you for nominated me to the blog award. It such a great honor to me. Thank you and God Bless. Thank you very much for reading 🙂 I am grateful you like my post and I hope and pray could be a blessing to and others. Thank you and have a blessed day.. Your spirit shines radiantly in your ability to guide and lead! Your words are very inspiring in sharing this truth! Thank you for the smile you birthed within my spirit! Spiritual hugs and blessings always my sister! Dear brother in Christ, Wendell. Thank you very much your beautiful word. God bless. Everyone one of us has failed at one point in time in our lives. But we we don’t have to give up. If we fail, or fall ,we should rise up, learn from the failures and keep going again. Dear brother in Christ, Victor.. Yes I absolutely agree with your comment. We should rise up again and again..also learn from the failure. There is old Chinese quote says, failure is a precious lesson 😉 Thank you very much for your wonderful response, brother. God Bless and have a wonderful Sunday. You are blessed too Karina. I see that you have a good heart. Please keep it up. without failure we cannot grow. Dear sister in Christ, Nancy. You’re so true. Thank you for reading. God Bless. The fear to fail and the fear to not rise up again is the biggest burden thrown upon us. What would I fear if the Lord God is with me! You are welcome 😉 thank you very much for reading and commenting my post. God Bless and have a nice day. First of all, thank you very much for visiting and reading my post. Yes I absolutely agree with you comment. I love your last word, mistakes and failure are proof we’re trying 👍 once again thank you very much for your great comment on my post. Have a nice day and God Bless. Father, I pray right now that this post be a blessing for every reader. Help us to understand any failure is a step of success. Help us to grow in weakness, help us to know you more in every step of this life. In Jesus Name Amen. Thank you very much for your encouraging comment and also for your prayer 🙂 I really..really appreciated. Thank you and God Bless. Thank you very much for reading and for the lovely comment 🙂 I am grateful you love it. Thank you and God Bless. I started a business earlier this year! It was awesome! I loved it and it made good money. Then I registered it, and set it up with the state. Then I had to jump through hoop after hoop to get it done right. And it ended up tanking my business. I couldn’t afford the insurance. I don’t consider it failing. I did the right thing. I chose to walk away and choose the ethical decision of paying taxes. Vs keeping it alive not paying taxes and making lots of money 🙂 I still miss it sometimes though. I guess that’s why I started my blog, because I missed organizing something. Thank you very much for visiting my blog, following, and also reading my post. I really appreciate your lovely comment about your business. Thank you and God Bless. What a wonderful and encouraging post! Failure is scary. I hate when I fail, and I do more often that I’d like to admit, but my greatest growth and ultimate victories have grown out from the ashes of failure. I hope your friend is encouraged by your post. Thank you so much for reading and for the lovely response to my post:) Yes I hope and pray this post could be a blessing and encourage others too..thank you and God Bless. This is SO good! I am so blessed by the way you encouraged that man! What wonderful words of life and truth!! Thank you very much for your encouraging comment, also thank you for visiting my blog. I really appreciate it. God Bless and have a wonderful Saturday. And thank you for visiting mine! The richest of blessings to you! Thank you very much 😃Thank you for visiting my blog. God Bless. Thank you very much 🙂 Also thank you for reading and liking my posts. I really appreciate it. Have a blessed day. Thank you very much for your lovely comment, sister Anna. Also thank you for reading again my old post. God Bless.